I'm currently in a state of trauma and it's all because of The Bridge. Two reasons: 1) the series has now finished so there's officially nothing good on telly any more and 2) the events at the end of the final episode completely finished me off emotionally. 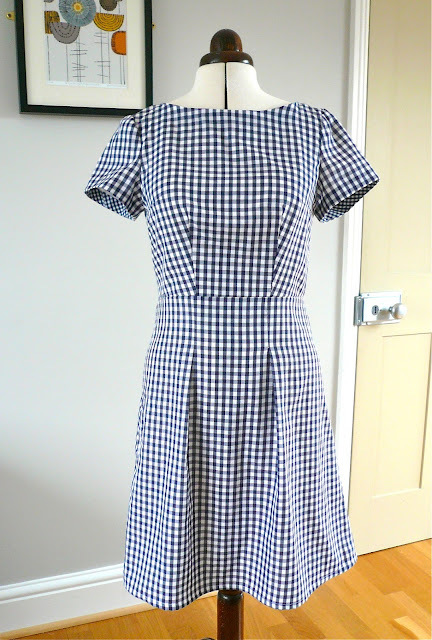 Maybe you need to read point number four from this post to get a better idea of what I'm wittering on about, but basically I need cheering up, big time, which is where my new gingham dress comes to the rescue. This is my second version of the Colette Patterns Peony dress, which is in navy gingham. If you've read this post and seen this board on Pinterest, then you'll know I've got a serious crush on gingham - it just lifts the spirits completely, which is why it's the perfect dress to photograph on my sad "end of The Bridge" day. The fabric is a cheap-as-chips poly cotton, which my local fabric shop was selling off for £1 a metre in a closing down sale. 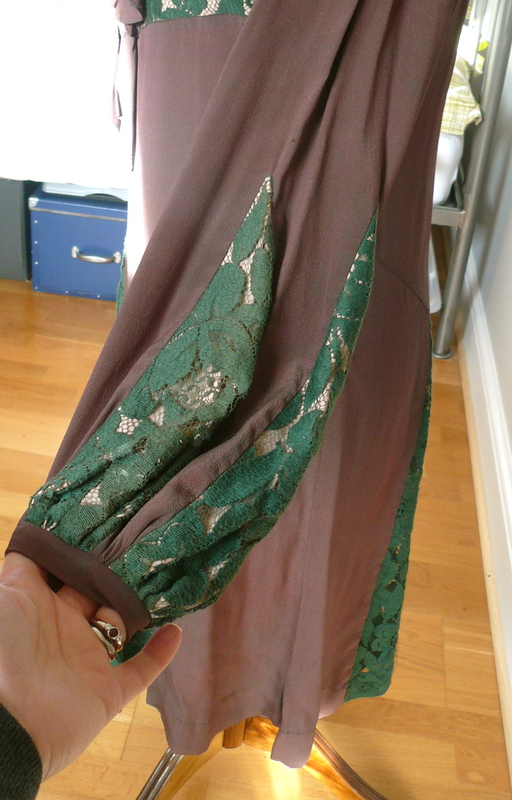 The quality of the fabric was pretty shoddy and transparent, which is why I decided to underline it. Blimey, what a difference. 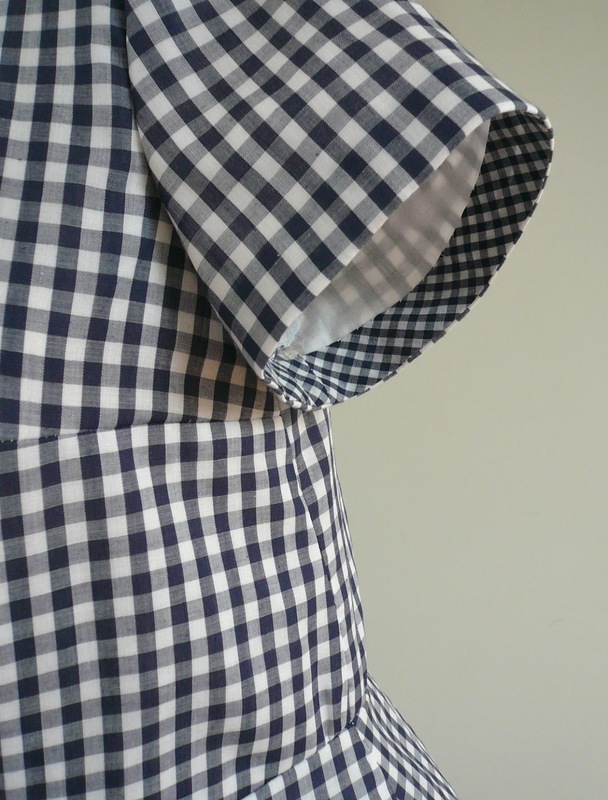 From looking pretty sorry for itself and actually a bit grey around the edges, the gingham suddenly looks fresher, cleaner, whiter and quite frankly much more expensive, when coupled with a nice white muslin underlining. 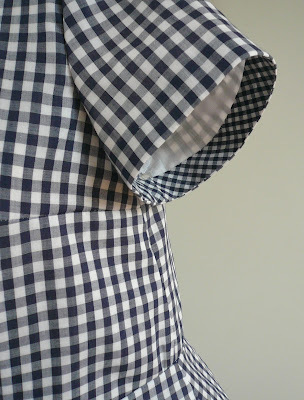 I'd highly recommend underlining a cheap fabric - as well as massively improving the appearance, it also gives the fabric much more structure and strength. I reduced the width of the boat neck in order to hide my bra straps, and lowered the curve of the neckline by about an inch. I added pleats to the skirt section rather than gathers, inspired by Beth's lovely version. 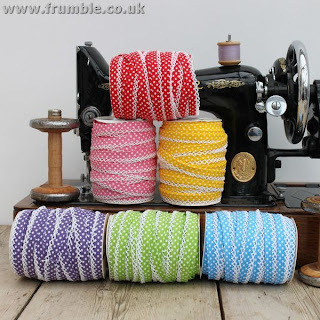 I eliminated facings in favour of gingham bias tape. 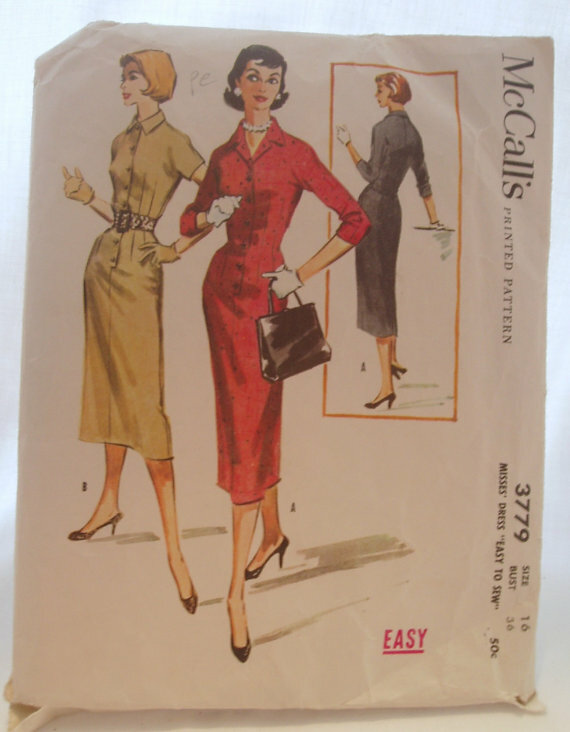 This was used on the neckline and also on the sleeves. I blatantly copied this from Lauren whose own sleeveless gingham version of the Peony I adore. Here's her tutorial for using bias tape as a facing. 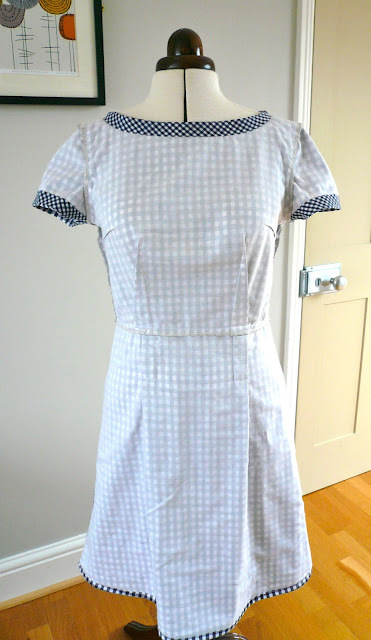 In a rare moment of forward planning, I also took a bit of time to try and cut the pattern pieces out to ensure the gingham lined up. It was MOSTLY a success and luckily it doesn't bother me too much if my makes aren't absolutely perfect. Considering how slapdash my method was, I think the lining up of the checks is pretty damn miraculous. This could well become my favourite dress of the summer - it's comfortable, fits well and feels fab to wear because of the lovely underlining. A few months ago I was given this beautiful vintage dress by my mother-in-law. She bought it from a vintage shop several years ago but having only ever wore it once, decided she'd like to pass it onto somebody who would appreciate it. Me, me, me!! It fits me perfectly, but the dress and my figure are probably not the best pairing. I'm too curvy and I think the style would look best on somebody taller, flatter and a bit more gamine. Nevertheless, it's a wonderful period garment that I'm very happy to have in my wardrobe and get out to play with from time to time. I'd also love to give my mother-in-law a little more information on what period the dress hails from, and date it as accurately as I can. This is where I need your help, lovely readers! 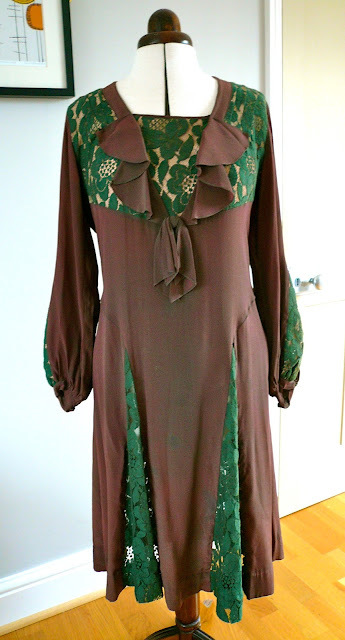 My guesstimate would be that this is a 1930's piece. Perhaps earlier rather than later in the decade as there's definitely a hint of flapper style about it. I also feel very strongly that this dress would have been worn with a hat as was typical then. If anybody who has knowledge of clothing from that period can shed any light, I'd be SO grateful. Or indeed if you have anything at all to say on when you think the dress might originate from, please chip in, I may be completely wrong so I'd be really interested to hear your thoughts. The dress is totally handmade, from what appears to be plum coloured silk crepe with dark green lace inset details. There's an impressive amount of hand finishing too. It has two kick pleats to the front and back and a dropped waist. The neckline is low, with a ruffle detail and shoulder tucks. It has what I think is called a dicky i.e. a detachable triangle of fabric that fits across a low neckline to preserve one's modesty! The sleeves are slightly puffed with a cuffed edge and lace inserts to add volume. It's just below knee length on me (I'm 5' 2"). 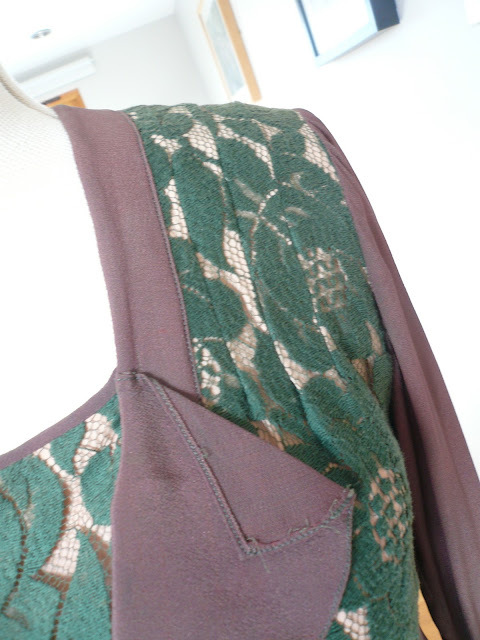 There's a lovely shaped detail to the skirt, which is mirrored on the back bodice yoke. 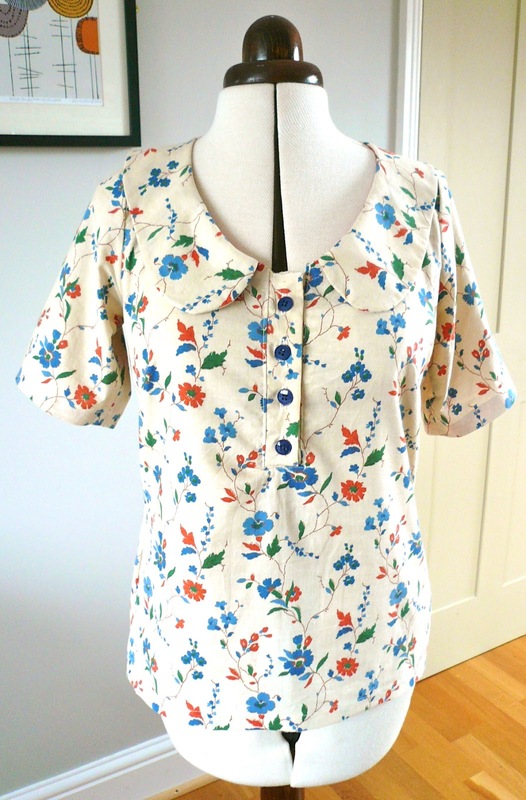 This is what made me think it was reminiscent of 1930's styles as my 1930's blouse has a V-shaped yoke. But when I re-examined it more closely, the V on my blouse was pointing down rather than up like the dress. Anybody know if this is significant? Yes, in true Sound of Music style, my latest make started life as a pair of old curtains. I bought them from a stall on Portobello Road market, along with these buttons, and just knew the two together would make a fab vintage style blouse. I used Megan Nielsen's Banksia pattern, primarily because I was drawn in by the oversized Peter Pan collar. The pattern was a delight: the instructions and diagrams are clear and well written and I like the fact that she gives lots of other suggestions for tweaking the pattern for different looks. I made a size small, but ended up taking it in quite a lot at the sides. If I'd taken the trouble to make a muslin, instead of slacking as usual, I'd have probably cut a medium at the bust (the small only just fits), tapering to an XS at the hips. Ah well. I'm reasonably pleased with the fit, but will probably wear it tucked in as it looks more flattering that way. What else can I say? 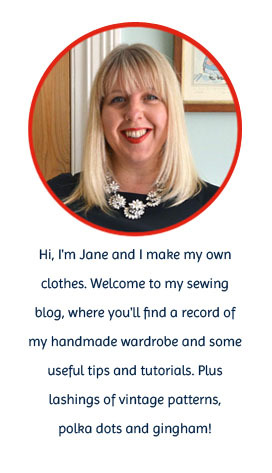 Well, I learnt a new technique - inserting a placket - which sadly I inserted upside down (sigh) - you can't tell though! The collar seams are finished with bias tape rather than a facing, which was another plus point for me - facings are just tiresome. I liked the look of the inside collar so much, I finished the sleeve edges the same way. I'm pretty pleased with my Banksia and will almost certainly make it again with a few tweaks. 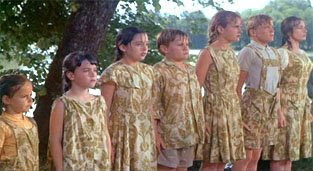 I've convinced myself it's definitely more Anthropologie chic than Von Trapp frump. .....is Clare from Magpie Makes!!! Congratulations Clare, please send me an email and I'll forward you the special £25 voucher code to spend in the Frumble online shop.